Little known secret: I absolutely hate when people wander the mall, staring at their phones, giggling to themselves, not caring about anything but social media updates or cat videos. It’s ridiculous. Fortunately, the recent release of Super Flippin’ Phones has enabled me to vent my frustration, flippin’ phones out of people’s hands to warn them about… well, whatever, because video game. It’s quite entertaining too – until you get caught by a mall cop. Those jerks. 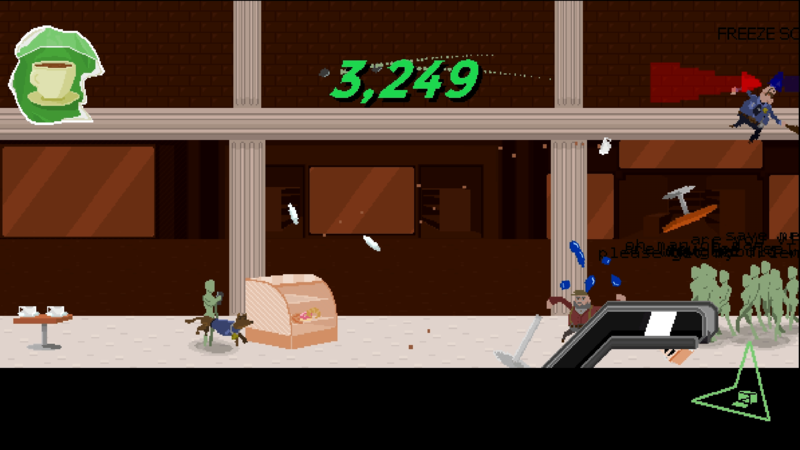 Seeing how much fun the original Flippin’ Phones – a freeware “product of 48 hours of game jamming” – from 2014 still is, one might wonder exactly what the deal is with this new ‘Super’ version. As it turns out, quite a bit, including unlockable additions: skins, additional floors / floor types, and even higher difficulty levels, have all been thrown into the mix, and much as I enjoyed the game jam version, this one is undeniably definitive. The basic concept does remain largely unchanged though, in that you still dash left or right, either smashing through or avoiding mall cops, while keeping an eye on your stamina (as depicted by sweat drops pouring out of the character – ew, by the way). Oh and you’re also able to trash the place as you go along, breaking everything from coffee stands to massive banners and everything in-between. And not just because it’s fun either, as hitting a cop with something besides your own body will also send the poor thing flying… without even breaking a sweat (get it?). In the real world, overexerting yourself is generally a pretty bad idea, but in Super Flippin’ Phones, it’s potentially a jail sentence, as you need energy to both jump and survive any and all physical encounters with authorities. Doesn’t matter if it’s your plain ol’ uniform, a police dog, an undercover fella or a flier – contact is contact. Some do drain more than other however, and if you’re standing still, it won’t matter how rested and relaxed you are. So keep moving, because the public needs to be warned about [insert random thing here]! Up one escalator, down another! Keep moving! To further cement itself as an over-the-top experience, the game has you ‘save’ people by passing an open box. No really. Run through a crowd and they’ll immediately follow you, but even though their phones have been removed at that point, you won’t be reaping the rewards – as in, points – until that next box visit. Also, the more you round up with each trip, the more points you’re awarded. More, more, more! Ahem. That said, unless I’m mistaken, the rate at which mall-goers reappear slows down significantly if you’re trekking around with a large following, so at some point you’ll probably want to simply ‘cash in’. One bad run-in with a cop and it’s game over, after all. An interesting, and very arcade-y, concept, to say the least. Fortunately it’s also one that works very well, challenges and unlockables adding longevity in the form of aforementioned extra floors / floor types as well as skins. Skins which, based on the one I’ve unlocked thus far – Action Henk – are actually based on characters from other indie games. Very groovy, even if they are purely cosmetic in nature. Same can’t be said about each floor in the mall though, as these really mix things up, featuring not only different smashables (or breakable objects, rather), but also unique enemy types. One of which comes with a super obvious Monty Python reference. You’ll see. Now, as far as gaining access to all of these additional goodies… well, it’s gonna take both time and skill, since the challenges required to unlock each additional floor features a rather questional design choice. 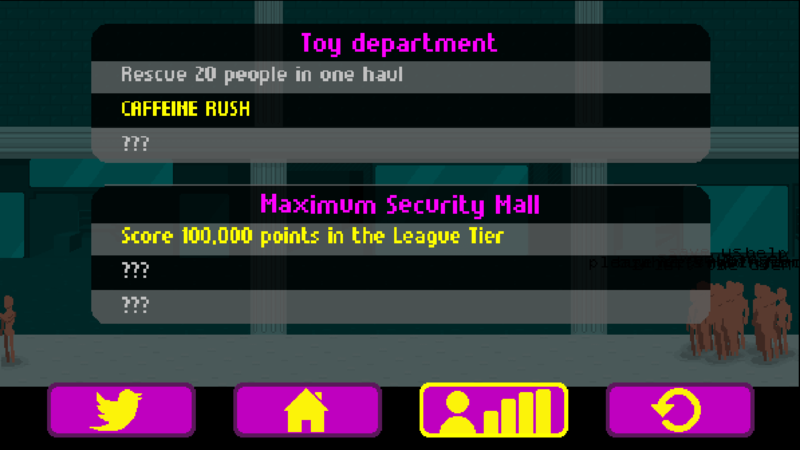 See, each carries a pre-requisite of three challenges, like scoring 10,000 points or rescuing 20 people at once. So far so easy, right? Yeah, except for the fact that you can only complete a single challenge in each run, which does seem a tad silly. Meanwhile, the acquisition of skins is a bit more random in nature. These, again, to the best of my knowledge, are actually hidden inside packages. Packages which appear randomly, with no rhyme or reason, and requires the player to stand still nearby for several seconds to open. Risk vs. reward? No kidding. Protip: don’t attempt during a run that’s gone really great so far, because that could easily change during the unwrapping process. Remember what I said about standing still? Exactly. While the game doesn’t really have any major downsides, it does have one slight annoyance, I’d say: the action can get pretty crazy, making it hard to see what’s going on as you attempt to dodge various cops, well aware of the fact that some hurt noticeably more than the rest. Given its quite lovely pixellated art style and fast pace, I doubt there’s a solution to this though, and at least retrying is pretty much instant. That and… even if you only manage to flip the phone of one person, a difference has still been made, a life potentially saved. Small beginnings and all that good stuff. 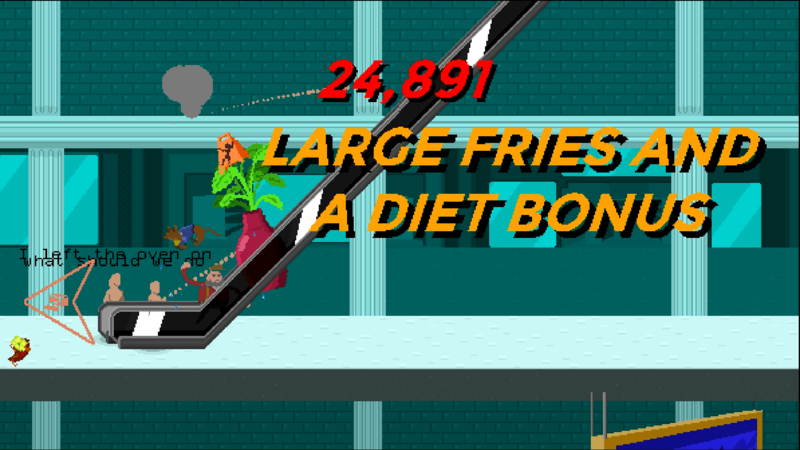 Super Flippin’ Phones is available from Steam (reviewed) [$2.99], itch.io [$2.75] and Google Play [$1.61 to remove ads].